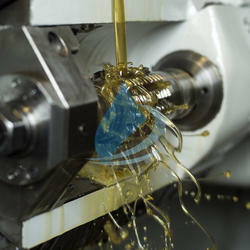 Prominent & Leading Manufacturer from Chennai, we offer synthetic cutting fluids and cutting fluid. Synthetic Cutting Fluids are most ideally suited for grinding and machining operations where high heat and friction is generated in the process SYN series provide good lubrication but more than provide best cooling propitiates, rust prevention and tank life. Cutting Fluid that is formulated for light and medium conditions and is fortified with oiliness additives for supreme lubricating and cooling performance. It is commonly used for mild steel, carbon steel, nickel and manganese steel and alloys of copper and aluminum. It is acclaimed for outstanding wetting properties and facilitates better productivity.